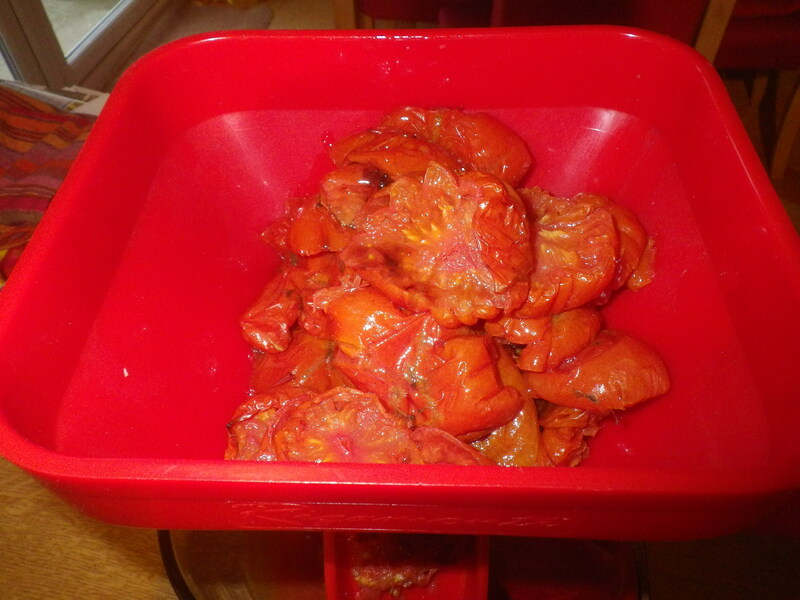 A trip to one of our local organic producers the other day yielded two bags of squishy tomatoes. I occasionally manage to get some of these and am really happy when I do. Because they are too fragile to be taken to farmers’ market, they are only available direct from the farm and because they are not premium produce, they are always cheap. To me, however, they are perfect for making passata… especially since I don’t tend to have great success growing tomatoes myself. I could bottle (can) them, but my preferred method of preservation is to make a concentrated passata and then to freeze it**. The approach is inspired by Hugh Fearnley-Whittingstall, namely that I roast the tomatoes first and then pulverise them. The roasting does two things – first it gives them a nice flavour; second, it reduces the water content, so I’m storing tomotoey goodness rather than liquid, which I can always restore later, but don’t need to keep in my freezer! In fact what I do is much more simple than what Hugh suggests. I cut the tomatoes in half and place them in a roasting dish. Then I drizzle them with oil (olive or sunflower, but whatever you like is fine) and I roast them in the oven until they are cooked through – soft and possibly slightly browned. If I’m doing them on their own, I’d set the oven to 180C/Gas 4 and cook them for about 60 minutes, but I often roast them when I’m cooking other things, and the temperature is flexible and the time can be adjusted accordingly. I used to sprinkle them with seasoning and perhaps garlic or herbs, but these days I tend to leave them unadorned for a more versatile end product. 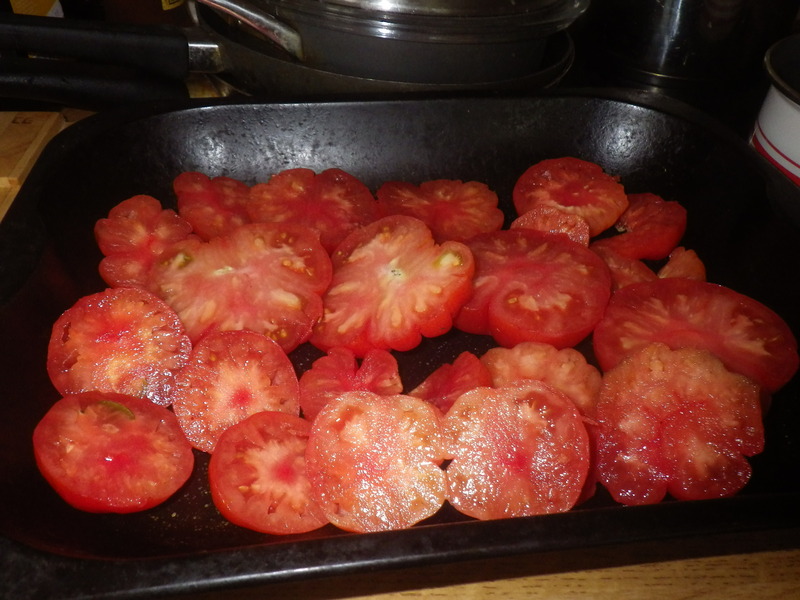 Once cooked, I leave them to cool in the tin (often overnight) and when they are cold I run them through my tomato mill – a magic machine that separates the the pulp from the seeds and skin. It’s hand cranked, so doesn’t take any electricity, but is a bit of a pain to wash afterwards. If you don’t have one of these wonderful items, you can simply sieve the cooked tomatoes, but this takes much more effort. Finally I separate the passata (i.e. 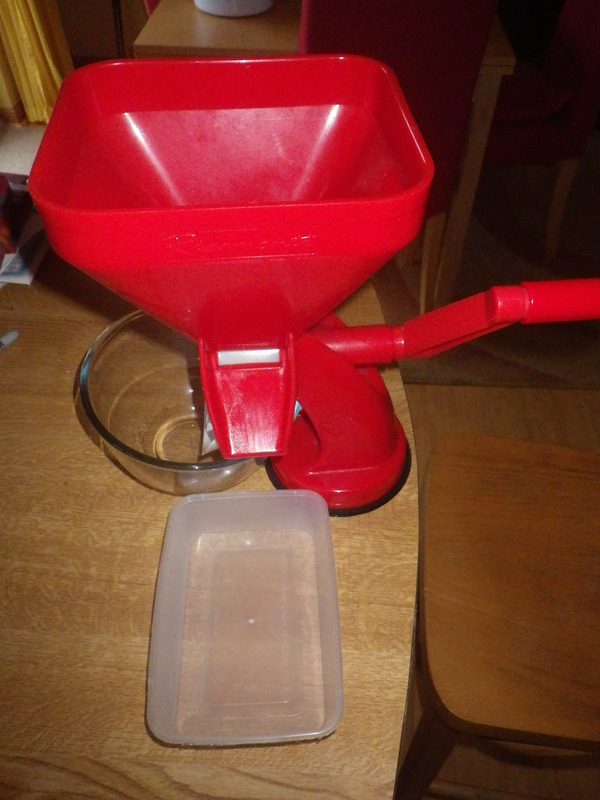 tomato pulp) into small containers for freezing. 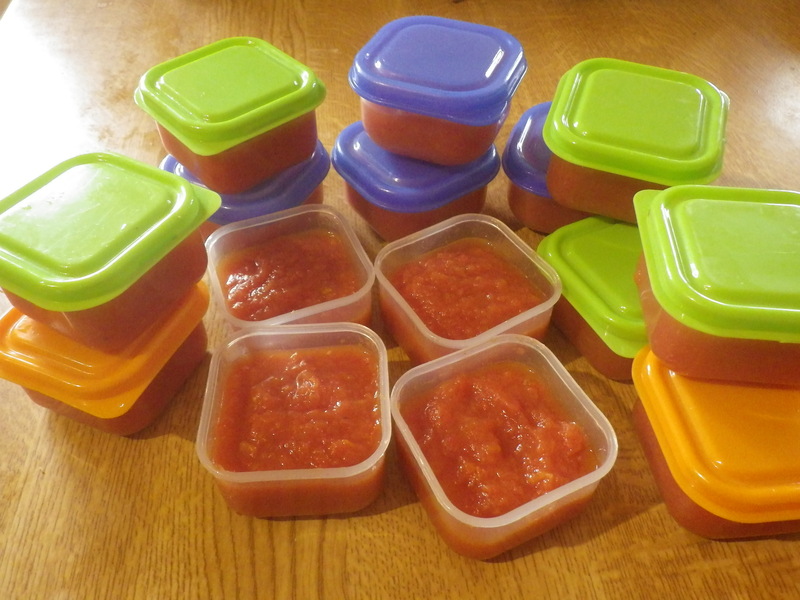 The little pots I use were sold as containers for baby food, but they are ideal for making small blocks of tomato. When required, you can defrost as many of the blocks as you require – one for a pizza or four for a bolognaise sauce – and enjoy the taste of summer through the winter. Update November 2015: These days I also bottle it in 250ml Kilner jars, to avoid the need to buy another freezer!! I am hoping for piles of tomatoes this summer, I make spaghetti/lasagne often (requested by the kids) and it seems I buy more passata than anything else! Hopefully I can make my own and not continue to buy buy buy. 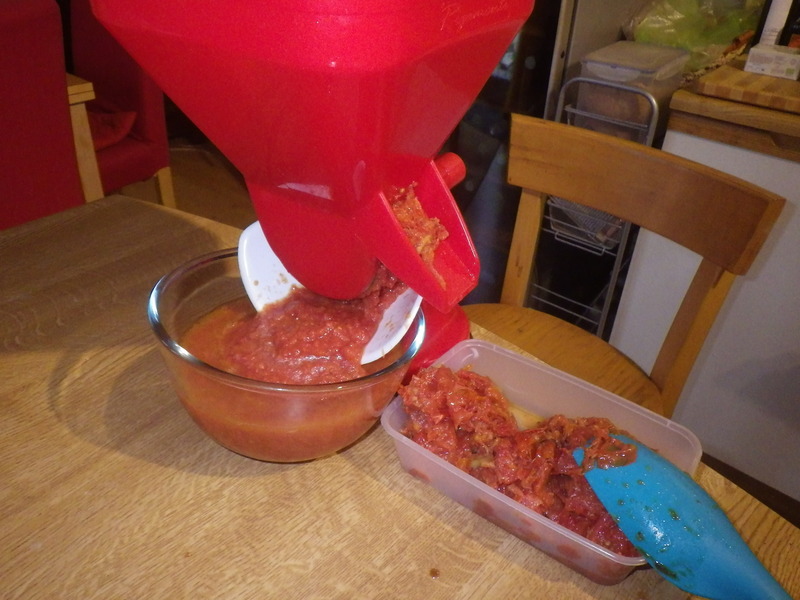 It’s always a bit hit and miss here with tomatoes, but my favourite thing to make with them is definitely passata… it’s SO useful.